So you've bought an adventure bike and you want to attack some terrain more aggressive than the drive-thru at your local Starbucks. I speak from experience when I say I know that it can be intimidating. You want to legitimately use your new ADV machine for its intended purpose but you're not sure where to start. Your friends all ride street bikes, you've never actually ridden off-road before and you're not even sure where to find local trails. Luckily, there are more resources available than ever before to help you get started. "You're not alone in your concerns," said Jeremy LeBreton, owner of the adventure gear company AltRider, which is why his company began hosting a series of events focused on larger ADV machines. Jeremy offering some last-minute riding tips at last year's Conserve the Ride. Photo by Spurgeon Dunbar. Acknowledging that it’s not always easy to convince those 10 friends to sell their cruisers, buy new bikes, and start crashing them in the woods, Jeremy decided to develop an alternative solution. That original spark of inspiration lead to the creation of AltRider’s Taste of Dakar for West Coast riders looking to tackle off-road terrain on ADV bikes. My off-road partner in crime, Steve Kamrad, attended this year as a ride leader and wrote about the experience for Common Tread. With the success of Taste of Dakar, AltRider created an East Coast alternative. In 2012, with help from the Seven Mountains Conservation Corp,, AltRider introduced Conserve the Ride. Shortly before my clutch gave out at last year's Pine Barrens 500. Photo by Steve Kamrad. For riders in the Southeast, there is March Moto Madness. 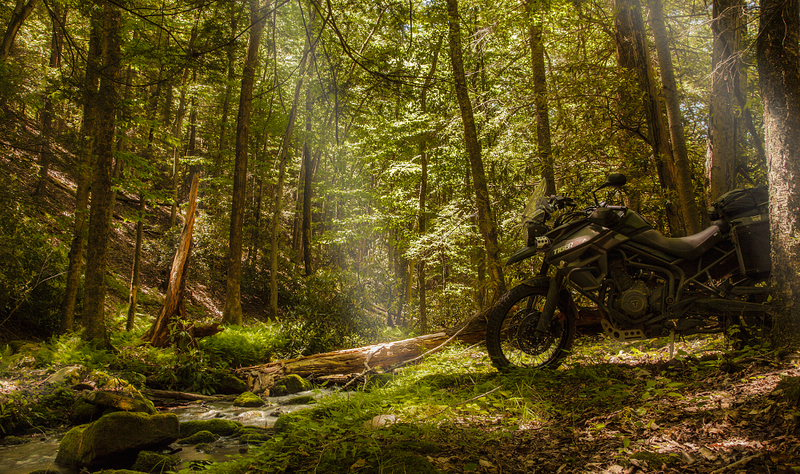 Originating in the sleepy mountain town of Tellico Plains, Tennessee, a bunch of like-minded riders got together for a weekend camping trip to ride some of the best trails the southern Appalachian mountains have to offer. This “camping trip” has continued since 2006 and in addition to the Tennessee location there are now March Moto Madness events held annually around the world. Starting out as nothing more than a camping trip, March Moto Madness has turned into an international event. Photo by Steve Kamrad. For 2017, we're even seeing enduro events opening their doors to adventure bikes. On a international level, the Red Bull Romaniacs, a notoriously wild and challenging extreme enduro race in Romania, is hosting an adventure bike class. Chris Birch and Gerhard Foster will be racing heavily modified adventure bikes, a KTM 1090 Adventure R and a BMW R nineT-based prototype, respectively. In the United States, one good place to start looking for an ADV ride is the American Motorcyclist Association's KTM AMA National Adventure Riding Series, which has rides all across the country. In Pennsylvania alone, June is shaping up to be a jam-packed month for off-road ADV-riding. There are two rides that are part of the AMA series, the Durty Dabbers Great Adventure Dual Sport ride June 10 and 11, followed by the PA Grand Canyon 300 the weekend of the June 23. The month will wrap up with this year’s Conserve the Ride weekend, which runs from June 30 to July 2. Rocky single-track made up option four at last year's Conserve the Ride. Photo by Steve Kamrad. Jeremy points out that Conserve the Ride is set up a bit differently from these other events in an effort to be as inviting as possible to riders of all abilities. Instead of choosing between two routes, one for dual-sport bikes and one for larger ADV motorcycles, there is one main route consisting of dirt and gravel roads with available options of varying difficulty along the way. Option eight at last year's Conserve the Ride shared a portion of the same trail as the dual sport loop for Durty Dabbers. Photo by Steve Kamrad. Riders can stick to a scenic dirt road loop or they can challenge their off-road chops with the options. Last year the options consisted of everything from single-track to rock gardens to large stretches of mud bogs. Lemmy and I, along with the rest of our RevZilla crew, made it through eight of the 10 options before a flat tire and waning daylight had us heading home on the main loop. This year, the site has changed but the flavor of the event will be the same. If you are the proud owner of an adventure bike (or a dual-sport) and you’ve always wanted to try riding it off-road, there are no shortage of events to attend. Of course finding a place to ride is no good if you don't have the skills you need to enjoy yourself. To meet the need for education, adventure-riding training programs have grown over the past decade alongside the popularity of the bikes. One well known training academy is RawHyde, founded by Jim Hyde and officially endorsed by BMW Motorrad North America. It is one of nine official BMW training facilities in the world (while you can rent BMWs, all makes and models are welcome to attend). Jim’s idea for an off-road riding academy got its humble start as nothing more than a multiple-day, dual-sport ride he hosted in 2002. Today, RawHyde is the leading enduro training facility in America with facilities in Colorado and California. 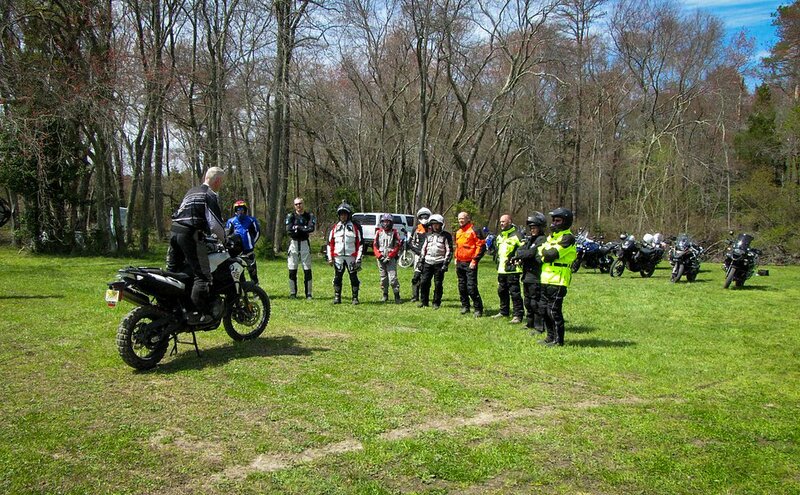 Mike Bradway teaching students how to get turned around on a hill at the Pine Barrens Adventure Camp Riding School. Photo by Jack O'Conner. In addition to RawHyde, West Coast riders can attend the adventure-bike class at Jimmy Lewis’ Off-Road Riding School. In the Northeast, you can attend classes at the Pine Barrens Adventure Camp Riding School and if you live in the Southeast there is the BMW Performance Center Off-Road Motorcycle Training. In some cases, you can find events that also host educational seminars along with the ride. Conserve the Ride is a perfect example, as they offer an optional training day. This year's clinic takes place on Friday and will be hosted by Bill Conger, a former Dakar racer and a BMW training director. He will focus on educating riders on basic off-road skills to better prepare them for Saturday’s ride. Learning basic control of your large ADV machine off-road will provide a solid foundation for you to build upon as your skills progress. Photo by Amelia Kamrad. Gaining a better understanding of how to handle these large machines will help to give you the confidence to start tackling some of those aforementioned events. As you attend more events, you'll start making more friends. Finding good people to ride with is often the hardest part when you're starting out in a new segment of riding. “Think about your life before you started dating Kamrad. Who did you ride off-road with?” Jeremy joked. Hilarity aside, he made a valid point. Fast friends: Steve, Amelia, and I in Canada two weeks after we met at Conserve the Ride. Photo by Steve Kamrad. It was actually at last year’s Conserve the Ride that I was first introduced to Steve and his wife, Amelia. I needed to buy beer, they lent me a growler, and the rest is history. Two weeks later we were piled into Steve’s Toyota 4Runner on our way to ride an endurance rally in Canada, an event that, for the first time, was hosting an adventure-bike class. That shows how fast you can make friends when you immerse yourself in the off-road community. Getting out and attending different off-road events in your area is a great way to make new friends to ride with. RevZilla photo. Befriending people who spend their time out and about riding in different events every couple of weeks helps to keep you engaged in the community as a whole. Plus those extra hands come in handy when you have to pick up a 500-pound adventure bike. I’ve become aware of so many more off-road events around the area through the people I've met at events like Conserve the Ride and schools like the Pine Barrens Adventure Riding Camp. So find an event or a school near you, sign up, and show up. Make some new friends, get a little better at controlling your machine, and most importantly, have fun! For those of you attending this year’s Conserve the Ride, I’ll see you there. I’d offer to buy you a beer, but AltRider will already be supplying the beer. Instead, I’ll happily offer to pump the tap for you while we share war stories around the keg.